Jeff Merrill grew up in a sailing family and started racing Naples sabots on Alamitos Bay in Long Beach, CA. He sailed for the Stanford University varsity sailing team and, a few years after graduation, took three years off to compete at the international level campaigning for the 1987 America’s Cup. Jeff started out in Bermuda as a tactician for the Courageous Challenge and was later recruited to join the Heart of America team where he was sailing coach for Buddy Melges and raced as navigator in a few of the AC trials races held in the Fremantle, Australia. Jeff is a career marine industry veteran. Over the last thirty years Jeff has worked in sales and marketing roles for several marine businesses including LeFiell manufacturing (spars), W.D. Schock Corp. (sailing dinghy’s and keelboats) and Magma Products (boat barbeques and accessories) before specializing in offshore cruising boats for the last twenty plus years. 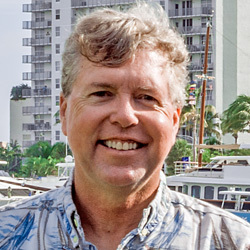 Jeff spent seven years as vice president of sales and marketing for cruising sailboat builder Pacific Seacraft (Flicka, Dana, Crealock’s) before joining Pacific Asian Enterprises, Inc. in 1999 to become involved with production and sales of the Nordhavn trawler brand where he excelled for fourteen years. He was the top sales producer three out of his last five years at PAE. Jeff understands boat construction from design to completion and enjoys training his clients to prepare them for offshore cruising. In January, 2014, he formed Jeff Merrill Yacht Sales, Inc., an independent yacht brokerage doing business on both US coasts and internationally with a focus on assisting buyers and sellers of cruising sailboats and trawlers. In 2011 Jeff served as Commodore of Alamitos Bay Yacht Club in Long Beach, CA. Jeff and his wife Pam race a Lido 14 when he is home in California. Their two children, Elle and Jonn, also have a passion for water sports. A renowned trawler specialist, Jeff has spent time aboard hundreds of different trawler models. He loves meeting with trawler owners to ask questions, learn their techniques and share ideas. Obsessive with his camera, he catalogs each boat he boards curating/developing an image archive that includes tens of thousands of photos. Jeff has sold hundreds of new and used cruising sailboats and trawlers. His professional approach and friendly, low key sales style has created hundreds of friendships with many repeat clients and referrals. His close relationships with clients finds him travelling literally all over the world to places like; South Africa, Japan, China, Taiwan, Turkey, Australia, New Zealand, Singapore, Thailand, Canada, Mexico and Panama. He especially enjoys spending time with his clients after the sale, training and traveling on the boats he has helped them purchase amassing over 20,000 miles at sea on a wide variety of trawler brands and sizes. Jeff was a crew member of the record breaking Nordhavn 40 Around the World (ATW) trip (Barbados to Panama and through the Canal) and joined the Great Siberian Sushi Run (GSSR) adventure with his son Jonn on a Nordhavn 62 when the fleet departed Japan and returned to the Ta Shing yard in Taiwan. Jeff has written dozens of stories about his trawler experiences with clients for the Nordhavn.com and JMYS.com websites. An accomplished author, he has also created a popular series of “Dialing-In-Your-Trawler” articles for Ocean Navigator magazine. Since 2001, Jeff has been a regular featured presenter at the PassageMaker magazine TrawlerFest events around the country. Jeff has also been a speaker at the Steve D’Antonio Trawler and Motor Vessel workshops and enjoys sharing clients and collaborating together with Steve to improve the professionalism in the marine industry. Jeff is a CPYB (Certified Professional Yacht Broker) and holds his yacht broker’s license in California and Florida. A member of four yacht broker associations, Jeff has been on the CYBA (California Yacht Brokers Association) board of directors since 2013 and served as president for two years, 2015 and 2016. Jeff’s enthusiastic personality, attention to detail, competitive drive, product knowledge and follow up skills has created an increasing demand for his services. Jeff is well known as a customer advocate, a broker whose clients trust implicitly. Jeff welcomes you to get in touch directly or with any of the JMYS sales associates. Please allow us to show you firsthand how we have earned our reputation for personal attention and can provide you with the type of experience you deserve.